Sherlock Holmes chases the person behind the pajama suicides in one of the best films in the Universal series. Filled will great characters I love Gale Sondergaard is a wonderful femme fatale, the film also has some killer set pieces including the conclusion in a shooting gallery with Watson unknowingly becoming the agent to of Sherlock’s death. During the war Watson volunteers and is sent to oversee an officer convalescence home in the Musgrave family manor house. When weird things begin to happen Watson sends for Holmes as things begin to deteriorate and people end up dead. 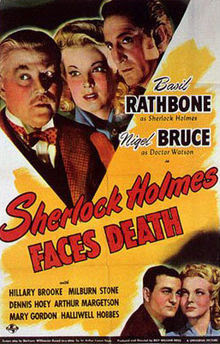 One of my favorite Rathbone and Bruce Holmes films is based on the Conan Doyle story The Musgrave Ritual. For me the film works because not only are the two stars at the top of their game but you have the double mystery going who is the killer and does the ritual actually mean. It’s a wicker ride that is quite simply a great deal of fun. In a small town some crazed beast is tearing apart the inhabitants. As the townsfolk cower in fear Sherlock Holmes and Dr Watson step in to the fray to stop the killer. 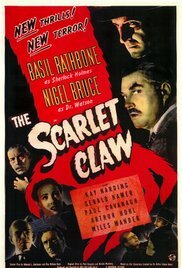 Easily one of the best of the series THE SCARLET CLAW plays more like a horror film than a mystery. Full of dark lanes and dread this is one of the few films that generate genuine suspense, even after multiple viewings. There is something about knowing who is doing it that makes the film even more creepy since not only is the killer hiding in plain sight he’s not one you’d ever expect. Truthfully his is scarier film than most of the horror films from the same time. An absolute joy from top to bottom.